I tend to get really pissed off when comic book movies stray from theirsource materials. I was hurt when I learned Spider-Man‘s webs actually came from his wrists instead of web launchers that he made. But in the end this was forgivable because the good outweighed the bad. The story was new but the overall details and spirit of the characters was preserved. Batman Begins doesn’t have this luxury and as much as its creators wanted it to restart the Batman franchise it doesn’t really accomplish anything more than Tim Burton’s 1989 Batman. Batman Begins is a half-hearted attempt to create a big budget summer smash while appeasing comic fans with what is supposed to be a faithful translation of Batman’s origin. It succeeded in doing the first of these things. Them’s some mighty pointy ears you got there, fella. Before I continue with the negative aspects of the film I do want to say that the actors were awesome. Christian Bale makes a perfect Bruce Wayne. Michael Caine a great Alfred and Gary Oldman, as strange as it seemed when I first heard he would play the part, is probably the best James Gordon that could have been cast. This is what could have been the start of a great film but it fails in every other aspect. Batman Begins seems to be loosely based upon the Batman: Year One storyline but with more liberties taken along the way than I care to count. At first I was excited to see that little details were added for the comic book audience. Characters like Detective Flass, Carmine Falcone and Zsaz are probably unknown to most moviegoers. Anyone who hasn’t read Frank Miller’s Batman: Year One wouldn’t realize that the device that summons the bats and the rooftop ending were taken directly from the book. But it seems like a slap in the face to these same fans to add this stuff but then change important details like excluding The Mark of Zorro, changing the entrance to the batcave, TOTALLY rewriting the Ra’s Al Ghul character, and replacing what should have been Harvey Dent with an unnecessary love interest. These are picky details, sure, but to me they are just as important as anything else in the film. world honing his body to be a living weapon but at the same time he is honing his mind to become the world’s greatest detective. 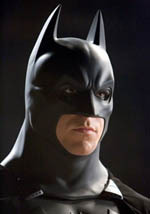 And while I appreciate the fact that the film focuses on Bruce’s training and his motivation for becoming Batman, The idea of him wandering the earth, lost and afraid with no purpose is way off the mark and takes away from the intense focus that Bruce Wayne has from the very beginning of his journey to rid Gotham of it’s criminal element. Batman Begins also (surprise!) introduces a new and totally unnecessary love interest. This serves no real purpose other than to cater to the “rules” of blockbuster movie-making. Rachel Dawes is a completely made-up character and serves no purpose in the transformation of Bruce Wayne to Batman or in his role as defender of Gotham City. And sharing his secret with someone other than Alfred or Robin (especially this early in his career) is one compromise that Batman would never make. The one thing that the 1989 Batman did right was to focus on one bad guy. Batman Begins gives us three to worry about (actually four if you count Watanabe and Qui-Gon Jinn as two separate villains). This makes for a rather convoluted situation between Falcone, Scarecrow and Ghul all somehow working together and gives little purpose for Falcone or Scarecrow being there at all. As much as I like Ra’s Al Ghul as a character, he doesn’t really fit an origin story. He’s just too complex. Ideally the focus would be just on Falcone and his mob but due the movie “rules” that I spoke of earlier a “super-villain” was inevitable. Along with these inconsistencies with the comic book world, Batman Begins is plagued with horribly cut fight scenes, clichéd movie elements (why does everyone have to be related somehow? Gordon was there when the Waynes were killed, Bruce’s childhood friend just happens to grow up to be D.A. of Gotham and the girl that he saves as Batman and Scarecrow and Carmine Falcone are somehow working with Ra’s Al Ghul to import rare blue flowers from halfway across the world to make Scarecrows fear gas. It’s all just so silly) and, in my opinion, a pretty dumb looking Batman costume. This movie doesn’t do everything wrong. Gordon and Alfred’s characters are played perfectly and it’s great that an emphasis was put on Bruce understanding that he must become something more than a man, a symbol of fear, in order to fight crime effectively. But like I said before, these things are far outweighed by the numerous changes that were made. The filmmakers should have taken a note from the producers of Smallville and recruited Jeph Loeb or geez, maybe Frank Miller (they only stole ideas and images directly from his work) as consultants or screenwriters. In the end (unlike the last two Batman films), Batman Begins is not a bad movie. It’s just a bad Batman movie. I think you should have done some thinking before you wrote the review. Firstly, this is a young Batman, just because your parent doesn’t mean it has to be something like: Alright my parents have been murdered I must hone my mind and body. No, it is realistic that he would be confused so it makes sense he would run away. For the same reason, he isn’t a detective yet, he has to still learn from EXPERIENCE because things just don’t come to you and text book can only take you so far, as Batman in the comics said. Rachel Dawes is one of them responsible for the creation of Batman; her inevitable scolding of Bruce is what lead to him running away. Gordon comforting Bruce is a way for their eventual friendship. Same way it is for Ras Al Ghul training Bruce and saving him because Bruce needed someone to teach him stuff. Overall, there are still sequels so Batman will own the detective title then, and Ras AL Ghul might return in one of them or at least Talia. I hope the new movie is as good as the hype. I loved Batman begins and this one looks even better….at least to me.